Our goal’s to help government make better decisions about policy by listening to citizens in the places they already are: social networks like Twitter and Facebook. 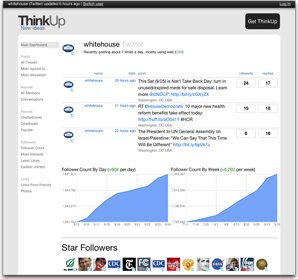 Our first project is ThinkUp, an open-source tool for archiving and visualizing conversations on social networks. It started with Gina scratching a personal itch, a way to parse and filter @replies. But it’s grown to be something more: a tool for policy makers to harness the collective intelligence of experts. There’s tons to do, but I’m particularly excited to tackle ThinkUp’s ability to separate signal from noise, making it easier to derive meaning from hundreds or thousands of responses, using visualization, clustering, sentiment analysis, and robotic hamsters. I’m planning on building some fun hacks on top of ThinkUp, as well as keeping an eye open for other vectors to tackle our core mission. Officially, I started on Monday and it’s already been an incredible week. 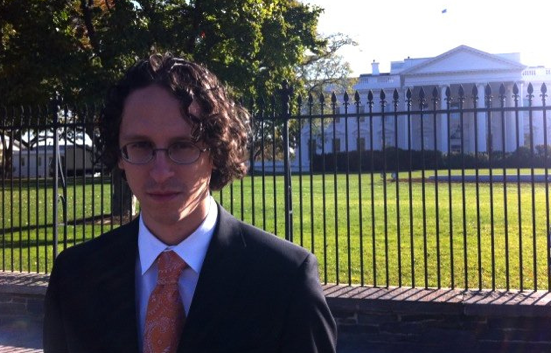 I flew to Washington DC, attended the FCC’s first Open Developer Day, and a day of meetings with various groups at the White House. What I found was inspiring: a group of extremely clever and passionate geeks, working from within to make things better. Some agencies are definitely more clueful than others, but it was clear that they want our — and your — help. I was skeptical at first, but they’re sincere: they want meaningful public participation and they need smart people to make it happen. Want to join in? The easiest thing to do would be to install ThinkUp on your server. Give it a try, see what you think and, if you can, contribute — code, design, and documentation are all welcome. If you’ve read Waxy for a while, you’ll know I very rarely touch on political issues here. It’s not that I’m apolitical — like anyone, I have opinions, but I don’t often feel engaged enough to write about it. It’s important. To tackle our most serious national issues, we need better communication between government and citizens. I want my son to grow up in a world where he doesn’t feel disconnected and disillusioned by government, and I want government to meet the needs of the people, rather than favoring those with the most money or the loudest voices. It’s exciting. Technology is quite possibly our best hope of breaking down that divide, using social tools to disrupt the way that governments are run and policy is made. I love designing and building tools that use social connections to tackle difficult problems, and it feels like government is an area ripe for disruption. I love the team. I’ve known Anil and Gina for years and have long admired their work. They’re both extraordinarily talented and creative people, and I feel lucky to call them both friends. The opportunity to work with them was too hard to pass up. How can I pass that up? And what about Kickstarter? I recently stepped back into my original advisory role, and will continue to help out the team however I can — dispensing unsolicited advice, recruiting new projects, writing the occasional article, and evangelizing for them around the world, like I did at Free Culture Forum in Barcelona two weeks ago. Kickstarter’s leading an indie-culture revolution, thanks to amazing leadership and a brilliantly creative team, and it was a pleasure working with them. This isn’t a change in direction for me, but a change in focus. Both Kickstarter and Expert Labs are bringing smart people together — people who might never connect otherwise — to create things, to change things, to make the world a better place. I can’t wait. So excited! This is going to be fun. Hope the White House went well! Congratulations, and may you conquer Washington with your robotic hamsters! Call people on twitter “experts” ? The vast majority are a bunch of inbred drooling morons – listening to them will only march us all into the abyss! Congrats! Was wondering about the “I’m at the whitehouse” autocorrect thing earlier in the week. Nice! All the best in your new efforts, Andy! Congratulations Andy! They’re lucky to have you. And, btw, Barcelona seemed to mark a career transition point for both of us. A suit again, eh? I’m jealous. You’ll do great! Wow, super exciting! Congrats, and I can’t wait to see what you come up with. Are you moving to DC? Adrian: Thanks! Not moving to DC, but I’ll definitely be spending plenty of time there. Congratulations, Andy. Great move for you! You didn’t have to post the photo for me to believe you went to the white house, but since you did, why did you let someone Photoshop you into a tie? Hey, I wore a suit and tie for five years at the financial company I worked at in Santa Monica. Ask Gordon! Aha! I was wondering why you took that pic! I should have asked 😉 Congrats! Congrats, Andy. This is a very interesting and crucial array of problems to get into! Congrats–that Expert Labs team is serious business. I’m excited by this notion of distilling online conversations for our leaders. Are you aware of what PopVox (http://www.popvox.com/) is doing? Are they, technically speaking, a competitor? Yeah, they’re doing good work. We’re both trying to accomplish similar goals in very different ways. Definitely more of a like-minded partner than competition. Congradulation! Andy….you will do very well at whatever you set your mind too. I’m impressed. Best Wishes to you!!!! Congrats! Seems like a perfect fit. Awesome! Congrats, Andy. This is excellent news! Congrats on the new gig! Looking forward to seeing what you come up with. Congrats, Andy! I, for one, welcome our new robotic hamster overlords. Congratulations, Andy. You are an amazing young man and Sam and I are so very proud of you. It’s encouraging to see great people like you, Anil and Gina working with the government. This is fantastic news for both you and the general population and government. I can’t wait to see the work you guys do! Congrats! Would like to learn more about how you define “meaningful public participation” and the kind of use cases ThinkUp aims to support in this area. Thanks! Thank you Andy, for understanding the needs for collaboration and transformation among people making, using, and implementing policies concerning technology. These policies will also influence how educational goals are created that integrate technology and compassion among children and their communities. Hopefully, not only with new practices breaking down those barriers that divide us, but will also contribute to a greater social understanding of each others’ points of view. Wish all the best in your new job!